Guest post by Christin Lee of InsiderEnvy. Eating healthy on the go isn’t easy. Whether you’re working in the office or traveling from city to city, the temptations can be endless. Stress, of course, the constant underlying factor for overeating or any type of headache, is always lingering in the back end. However, you can combat hunger and idle eating by bringing your favorite foods on the road, skipping beers at the end of the travel day, or meal prepping at the beginning of the week. Try these few simple changes that can help transform your life and give you the happy healthy body to keep you going. Take 5 minutes upon waking, during your commute, or at work to connect with your inner self. Breathing makes your body and mind a calm and beautiful wonderland. Make your mental and physical health a priority by setting the mood for the work day with a mindfulness walk. Deep breaths can help release any lingering anxiety as well as help cognitive function, performance, and focus. Our bodies are made of 60% water. Clean your body from the inside out by drinking at least 2 litres of water per day. Drinking water first thing in the morning as well as before making an impulsive dip into the snack bar is keyto maintaining your health. When you’re dehydrated, the mind and body are weak causing blood sugar to rise. 9 times out of 10, office hunger is actually thirst. It’s all the more easy to succumb to sweet and salty office temptations when you’re thirsty. Luckily, you can satiate a ‘false hunger’ alarm with a glass of cold water. Aim for nutrient dense whole foods. Hippocrates once said ‘Let food be thy medicine and medicine be thy food.’ Eat for your health by opting for a handful of almonds rather than the midday bag of chips. Veggies with hummus, bananas with peanut butter, and greek yogurt are all excellent choices. Raw fruits and vegetables are also dense in water that can help keep you hydrated and energized throughout the day. When eating, eat slow. Take your time. 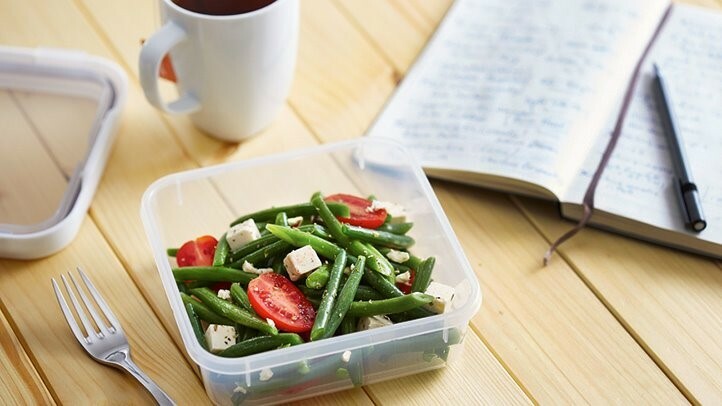 Your lunch isn’t going anywhere and if you’re worried about not finishing your lunch before your lunch break is over, make it a practice to eat half and take the rest to go. It takes 30 minutes for your stomach to tell your body it’s full so stop, breathe, and listen to your body. The power of no is well…powerful. It’s a virtue of mind control and self discipline that eventually becomes habit. Don’t succumb. Setting rules for eating dinner earlier or fasting after 5PM can be a good start. As a rule of thumb, form is always deforming. It requires careful critique and constant rebuilding. It’s not a one-size-fit-all plan. Everybody has different body types, appetites, metabolisms, and lifestyles. Don’t give up on your first try: the key is to keep going. The trial and error period will soon solidify into a process and healthier you.